Tokenizing (splitting a string into its desired constituent parts) is fundamental to all NLP tasks. There is no single right way to do tokenization. The right algorithm depends on the application. I suspect that tokenization is even more important in sentiment analysis than it is in other areas of NLP, because sentiment information is often sparsely and unusually represented — a single cluster of punctuation like >:-( might tell the whole story. @SentimentSymp: can't wait for the Nov 9 #Sentiment talks! YAAAAAAY!!! &gt;:-D http://sentimentsymposium.com/. All HTML and XML mark-up has been identified and isolated. HTML character entities like &lt; and &#60; have been mapped to their Unicode counterparts (< for both of my examples). These steps should be taken in order, so that one distinguishes the token <sarcasm>, which is frequently written out as part of a text, from true HTML mark-up (which is not seen directly but which can play a role in tokenization, as discussed below). @SentimentSymp: can't wait for the Nov 9 #Sentiment talks! YAAAAAAY!!! >:-D http://sentimentsymposium.com/. Some tokens are unintuitive — for example, talks! 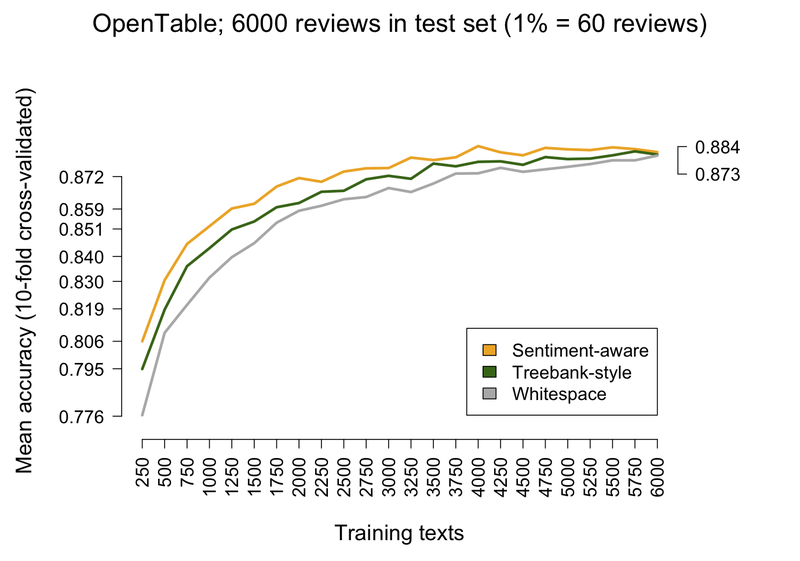 The Treebank-style is the one used by the Penn Treebank and many other important large-scale corpora for NLP. Thus, it is a de facto standard. This alone makes it worth considering, since it can facilitate the use of other tools. @ SentimentSymp : ca n't wait for the Nov 9 # Sentiment talks ! YAAAAAAY ! ! ! &gt; ; : -D http : //sentimentsymposium.com/ . Contractions like can't contribute their own sentiment, as distinct from co-occurrence of can and a negation, whereas the Treebank style splits them into two tokens. Almost all tokens that involve punctuation are split apart — URLs, Twitter mark-up, phone numbers, dates, email addresses ... Thus, emoticons are collapsed with their component parts, URLs are not constituents, and Twitter mark-up is lost. The purported value of this style is that it can smooth integration with other NLP tools. However, because the tokenization of raw Web text is so bad, later applications are likely to stumble also if used unmodified. I now review some of the major aspects of a sentiment-aware tokenizer. You are likely to want to tailor these suggestions to your own data and applications. Emoticons are extremely common in many forms of social media, and they are reliable carriers of sentiment. Twitter includes topic and user mark-up that is useful for advanced sentiment modeling. Your tokenizer should capture this mark-up if you are processing Twitter data. Where sparseness is not an issue, informative tags can be seen as annotating all the words they contain. For strong, strong, b, em, and i, I often capitalize them, to collapse them with words written in all caps for emphasis. Punctuation should be kept at the tokenization stage. We will shortly use it to identify further structure in the tokenized string. Thus, the goal for tokenizing is to properly distinguish various senses for the individual punctuation marks. We already tokenized a variety of things that involve word-internal punctation: emoticons, Twitter and HTML mark-up, and masked curses. In general, sequences mixing only letters, numbers, apostrophes, single dashes (hyphens), and underscores are words. Sequences consisting entirely of digits, commas, and periods are likely to be numbers and so can be tokenized as words. Optional leading monetary signs and closing percentage signs are good to allow as well. The remaining punctuation can be kept as separate words. By and large, this means question marks, exclamation points, and dollar signs without following digits. I find that it works well to tokenize sequences like !!! into three separate exclamation marks, and similarly for !?!? and the like, since the progression from ! to !! is somewhat additive. At later stages, you might want to filter some punctuation, because its very high frequency can cause problems for some models. I advise not doing this filtering at the tokenization stage, though, as it can be used to efficiently identify further structure. Preserving capitalization across all words can result in unnecessary sparseness. Words written in all caps are generally worth preserving, though, as they tend to be acronyms or words people intended to emphasize, which correlates with sentiment information. Lengthening by character repetition is a reliable indicator of heightened emotion. In English, sequences of three or more identical letters in a row are basically unattested in the standard lexicon, so such sequences are very likely to be lengthening. The basic strategy is to tokenize these greedily, first, and then proceed to substrings, so that, for example, November 9 is treated as a single token, whereas an isolated occurrence of November is tokenized on its own. If one starts including n-grams like really good as tokens, it is hard to know where to stop. For large enough collections, bigram or even trigram features might be included (in which case you can tokenize without paying attention to these phrases). For smaller collections, some of the mark-up strategies discussed later on can approximate such information (and often prove more powerful). The tokenizer that I use for sentiment seeks to isolate as much sentiment information as possible, and it also identifies and normalizes dates, URLs, phone numbers, and various kinds of digital address. These steps help to keep the vocabulary as small as possible, and they provide chances to identify sentiment in areas that would be overlooked by simpler tokenization strategies (July 4th, September 11). @sentimentsymp : can't wait for the Nov_09 #sentiment talks ! YAAAY ! ! ! >:-D http://sentimentsymposium.com/ . The social-media mark-up is all left intact, the date is normalized, and YAAAAAAY has been put into a canonical elongated form. How important is careful tokenization for sentiment? Is it worth the extra resources? I now address these questions with some experimental data concerning classifier accuracy and tokenization speed. I randomly selected 12,000 OpenTable reviews. The set was balanced in the sense that 6000 were positive (4-5 stars) and 6000 were negative (1-2 stars). The classifier was a maximum entropy model. The features were all the word-level features determined by the tokenizing function in question. The amount of training data is likely to be a major factor in performance, so I tested at training sizes from 250 texts to 6000 texts, in increments of 250. At each training-set size N, I performed 10-fold cross-validation: for 10 runs, the data were randomly split into a training set of size N and a testing set of size 6000. The accuracy results from these 10 runs were averaged. Figure fig:tokenizer_accuracy reports the results of these experiments. Assessing tokenization algorithms via classification. In addition, I ran a version of the above experiment where the testing data were drawn, not from the same source as the training data, but rather from another corpus with the same kind of star-rating mark-up — in this case, 6000 user-supplied IMDB reviews. Such out-of-domain testing provides insight into how portable the classifier model is. Figure fig:tokenizer_accuracy_xtrain summarizes the results from this experiment. Overall, the performance is less good and more volatile, but sentiment-aware tokenization is still the best option. Assessing tokenization algorithms via classification: out-of-domain testing on IMDB reviews. My take-away message is that careful tokenization pays-off, especially where there is relatively little training data available. Where there is a lot of training data, tokenization matters less, since there is enough data for the model to learn that, e.g., happy and happy," are basically both the same token, and it becomes less important to capture the effects of any particular word, emoticon, etc. As tokenizers get more complicated, they of necessity become less efficient. Table tab:tokenizer_speed illustrates. For many applications, this is not a problem, but it can be a pressing issue if real-time results are needed. The Catch-22 is that the really fast tokenizers require a lot more data to perform well, whereas the slow tokenizers perform well with limited data. Tokenization is easily parallelized, so the effects of the slow-down can be mitigated by good infrastructure. Good tokenizer design will pay off, especially where the amount of training data is limited. Where there is a large amount of data, careful tokenizing is less important. Good tokenizer design might be especially important for sentiment analysis, where a lot of information is encoded in punctuation and non-standard words. Good tokenizing takes time, which might be an issue for real-time interactive systems. However, the times involved are unlikely to be prohibitive for off-line systems: tokenization is easily parallelized and can be optimized based on known properties of the text.